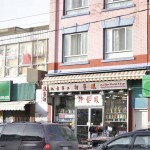 PRINCE RUPERT, B.C. 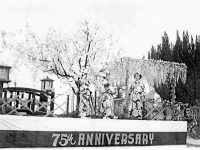 — When Edmonton taiko drummer Greg Shimizu and his partner Twilla were deciding on a name for their taiko duo, Shimizu says he was inspired by the actions of his grandfather 60 years before. Photo courtesy: Greg Shimizu. 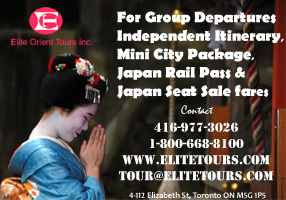 Choosing, “Booming Tree Taiko Duo,” as a way to honour the 1,500 sakura trees his grandfather, Shotaru “Tom” Shimizu, donated to the city of Prince Rupert, B.C. between 1959 and 1960. 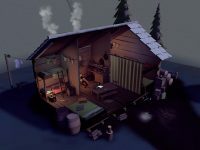 “It appealed to us because it had a nod to my grandfather’s donation and connected to what we wanted to do,” Greg tells Nikkei Voice in an interview. 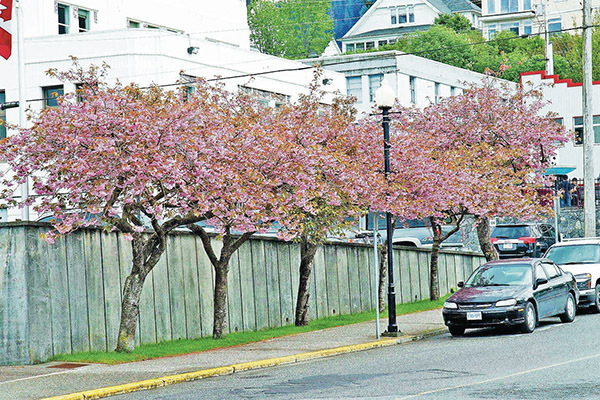 On March 23, 76 years to the day that Tom was evacuated from Prince Rupert, those sakura trees planted outside of the Department of Fisheries and Oceans (DFO) were cut down and chopped into pieces. A before and after look at the sakura trees on the corner of Fourth St. and Second Ave. outside the Department of Fisheries and Oceans. Photo Credit: Phuong Nyugen/Courtesy Greg Shimizu. Tom, migrated from Japan to Prince Rupert in 1905 to work on the Grand Trunk Pacific Railway. He was attracted to the city for its potential as a port city. Hopes for development died with Charles Hays, an industrialist, aboard the Titanic. Instead, Tom opened a 30 room hotel and restaurant with his friend George Nishikaze and a business call New Dominion in 1917 on Third Avenue. 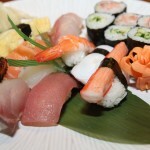 The business flourished, even during the depression, explains Greg. On Feb. 26, 1942, Tom was told he would be removed from Prince Rupert. On March 23, 1942, Tom, with his wife and children left for Hastings Park on the same railway he helped build years earlier. 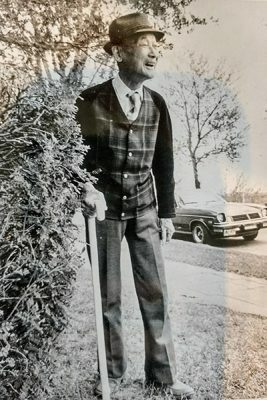 A photo of Shotaru “Tom” Shimizu, who donated 1,500 sakura trees to the city of Prince Rupert and private citizens between 1959 to 1960. Photo courtesy: Greg Shimizu. The family was then sent to New Denver, their hotel was seized and sold by the Custodian of Enemy Property. After internment, their hotel gone, the family resettled in Edmonton, where Tom’s son, Henry, went to medical school at the University of Manitoba. 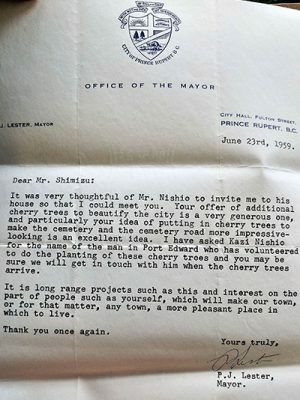 In 1959, while still living in Edmonton, Tom arranged to have 500 sakura trees imported from Japan to Prince Rupert, and planted in the cemetary, Port Edward School, the Miller Bay Indian Hospital, to private citizens and the newly built federal building (now the Department of Fisheries and Oceans). 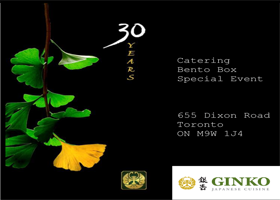 In 1960, another 1,000 sakura trees were donated to the city. 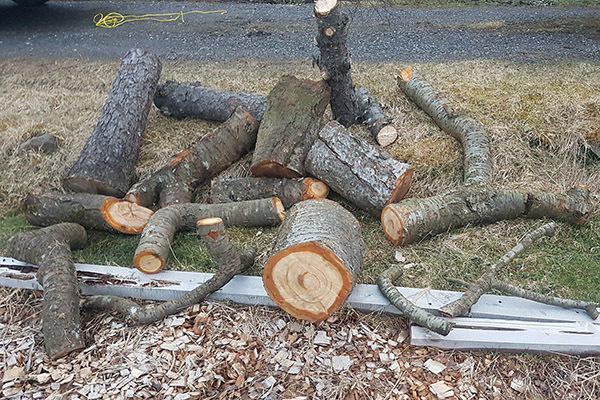 The trees were cut down as part of a federal contract from Public Services and Procurement Canada. 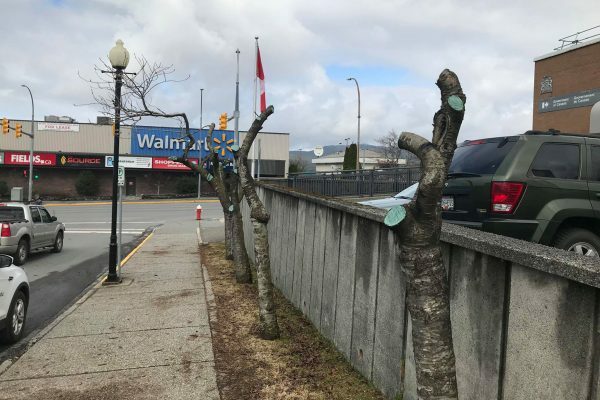 Prince Rupert Mayor Lee Brain made it clear in a statement on Facebook the federal government made the decision, and the city was not consulted or even notified before the trees were chopped down. “Never in a million years would [city] council, or anyone at the city, chop these beautiful trees down,” said Brain. “The intent of the redesign is to modernize the landscaping. We are looking at replanting the site, possible with a native species that is disease and pest-tolerant,” said a statement from Dan del Villano, regional manager of communications for Public Works and Government Services Canada. 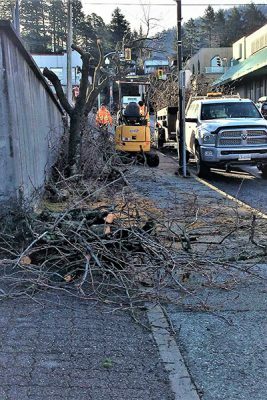 The cutting of the trees created an uproar in the city, many community members stating the trees had been there as long as they could remember. “It struck them [Tom] meaningfully found a home in Prince Rupert and wanted to give a meaningful gift even though he wouldn’t be returning home,” says Greg. Tom was going blind during the time of his donation, and would never be able to see the trees, explains Greg. Looking to rectify what was done, a handful of people tried to get some of the salvaged wood to Greg. Inspired by the outpouring of support from the city and all of the comments from citizens whose were lives touched by the trees, he made a plan to turn the wood into bachi, taiko drumsticks, and distribute them to any taiko group he could reach. Now, a month after the trees were initially cut down, Greg is still waiting for concrete answers from the contractor to receive the wood, 1,500 miles away from Prince Rupert in Edmonton. The trees were meant to be a gift to the city that gave Tom so much joy. This idea is to extend the trees’ meaning, says Greg, which is why he hopes to turn the wood into something that gives him joy, taiko, and to pass that on to others. A copy of a thank you letter from Prince Rupert Mayor P.J. Lester to Tom. Photo courtesy: Greg Shimizu. Mayor Brain is working with the federal government to try and rectify the situation, and make sure something like this never happens again, he continued in his statement. The federal government should consult with the community before decisions in Ottawa are made for cities across the country, he wrote. 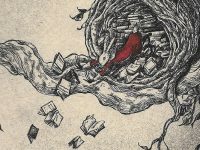 He also wrote that he is looking for suggestions from the community on what to do next, whether it is to plant more trees or place a plaque with the history of the trees, for everyone to learn about the generosity of one man, years ago. In a box Greg found under the stairs in his dad’s home in Victoria were correspondence from all the people touched by Tom’s donation years ago.